Had it not been for the Depression, or the associated fact that footballers often needed to supplement their income by chasing more money in country leagues, ‘Leo’ Wescott could well have played in all four of Collingwood’s Premiership sides from 1927-’30. 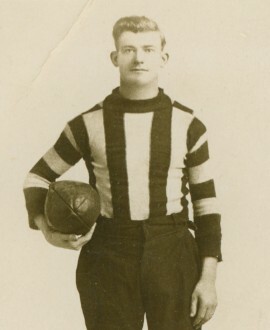 Wescott represented Collingwood in the back pocket in two flags – in 1927 and ’29. He was a solid defender, a “neat and straight kick” and a firm believer in the Magpie cause, partly because he was born and bred in the suburb, and also because his father, Alf, had played with the Collingwood Juniors – the Magpies’ unofficial feeder team – back in the 1890s. In fact, Alf captained the Juniors for the best part of four seasons (part of 1894, then 1895-97), before he suffered a career-ending broken leg playing against Hawthorn in 1897. Henry David Wescott came into the world a few years later in 1900, and the midwife who delivered him nicknamed him “Leo” because of a supposed resemblance to Pope Leo. The name stuck and the Collingwood footballer carried it for the rest of his life. After he left the Gold Street school he played with Clifton Hill Imperials, then spent four seasons with the Collingwood Districts team (our seconds team), playing mostly on the wing. One newspaper reported that he attracted the attention of the senior selectors while with the Districts, where he “rendered good service, showing great dash and determination, marking well for a littlew fellow and always trying to help his mates”. He played in two flags with Districts, in 1919 and 1920, and won a gold medal for ‘good play’ in 1920. In 1922, with Bill Twomey Snr having left for the country, a vacancy opened up on one wing in the senior side. And that’s where Leo finally got his chance. He filled that position in Collingwood’s losing senior Grand Finals of 1922 and ’25, but the next year was moved into defence – and that’s where he really made his mark. Wescott filled the back pocket role with aplomb in the Magpies’ 1927 flag. But he then moved to Dimboola as playing coach (the money was vastly superior in many country coaching jobs, or came with employment attached as well) and steered his new team to a Premiership. He was back at Victoria Park again for 1929 and took over where he left off, playing 17 of the 20 games and again being there on Grand Final day. Then, just like that, he was gone again – appointed playing coach of Longford for 1930 and taking teammate Bob Muir with him. His consolation for missing another Magpie flag was the Northern Tasmanian Association’s equivalent of the Brownlow Medal. He returned to Victoria Park for one final stint in 1931. Like teammate Bill Libbis, he was honoured long after his death with a life member’s certificate, despite his absences. He deserved it after the time he had spent as a player, a vice president and founding member of the Collingwood Past Players Association, and as an easy going, friendly, “life of the party” type at the various past players’ functions and picnics. But Wescott’s football career didn’t end with Collingwood. He captain-coached Kyneton, led Prahran to its first VFA flag in 1933 and also coached Sandringham for four seasons. It was at Sandringham that he made a comeback one day – at the age of 42 – because of a shortage of numbers, and still managed three goals. One of Wescott’s little known legacies to Collingwood came long after he retired, when he helped to tutor a young kid by the name of Bill Twomey Jr. at Fairfield YCW in the early 1940s. A nice touch, given that it had been Bill’s dad’s move to the country that gave Leo his first crack at senior football with Collingwood back in 1922. The younger Twomey would go on to become a gifted, if enigmatic, Collingwood star – perhaps the antithesis of the reliable, no-frills player that Leo Wescott had been throughout a largely understated but valuable career.